This webinar was offered by the Ontario CLRI hosted at the Schlegel-UW Research Institute for Aging and was presented on February 27, 2018. Dr. George Heckman graduated in 1991 Doctor of Medicine at University of Toronto, Ontario Fellow of the Royal College of Physicians and Surgeons of Canada, with specialist certification in Internal Medicine (1999) and Geriatric Medicine Master of Science (Health Research Methodology, McMaster University in 2006). 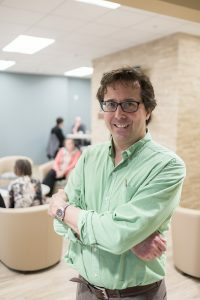 He holds a Schlegel Research Chair in Geriatric Medicine and is presently an Associate Professor with the department of Public Health and Health Systems at the University of Waterloo as well as an Assistant Clinical Professor of Medicine at McMaster University. Research interests include management of heart failure in long term care and other frail seniors, primary care management of dementia, home care safety and vascular aging. GeriMedRisk is an interdisciplinary telemedicine geriatric clinical pharmacology and psychiatry consultation service available to clinicians. This toolkit is designed as a health professions education resource for educators seeking to teach healthcare staff and students on using the Confusion Assessment Method (CAM) to screen older adults for delirium in long-term care.